Zack Ruskin: My New American Life, your latest novel, has been touted as being set in a “post-9/11” atmosphere. As a resident of New York City, when did you decide you wanted to address this topic, or did it manifest itself organically in the narrative? How would you define the “post-9/11” atmosphere? 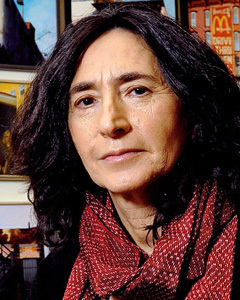 Francine Prose: Just yesterday I was in a part of Brooklyn that for a long time has been home to an Arab-American community, and I was thinking about the months, right after September 11, when the neighborhood was crawling with cops, apparently sent to monitor innocent schoolchildren and shopkeepers selling olive oil and baklava. Now that Obama is in office, and things are somewhat different, I’ve been shocked by how quickly we’ve forgotten the excesses, the threat to our civil liberties, and the mass national depression that gripped us during the Bush-Cheney years. I wanted to say, “Hey, remember, that happened!” But I wanted to do it in a funny, entertaining, sympathetic way. ZR: Lula, the protagonist of My New American Life, is Albanian. What research did you do to write her character, and what inspired the choice of her ethnicity? FP: I love Lula so much!!! I had so much fun hanging out with her (in my mind) while I wrote the novel. I wanted a character from the most sealed-off, psychotic corner of the Eastern bloc who would be smart enough and funny enough to realize how much it resembled the U.S. I went to Albania for two weeks. I totally adored it. The food was amazing and the people friendly. ZR: You’ve had an astoundingly prolific output as a writer. Do ideas strike you one at a time, or have you found yourself in the various stages of multiple works at once? When you first published Judah the Pious, did you think you’d have so many more novels in you? FP: I’m always writing articles and always trying to work on a novel and always trying to help support an increasingly large extended family. When I published my first novel, somehow I didn’t realize that actual people wrote novels. I thought they were written by invisible powers and somehow wound up in libraries. So of course it didn’t occur to me that one of these invisible powers would write two novels, let alone three. It’s been a big surprise. ZR: In addition to your own work, you’ve been called upon to review others’ books for publications like The New York Times and Harper’s. Is there any kind of inherent obligation when judging a peer? Put another way, how challenging is it to truthfully and objectively dissect another’s work when your own pieces are destined to end-up on a similar chopping block? FP: I no longer write about books I dislike, unless a book maddens me for some reason, and that happens less and less often. I try to save my rage for deserving objects, like Halliburton, for example, and not some hapless first novelist. I think of my function as a critic as an effort to figure out what an author might have been trying to do, and to alert those readers who might like a book in which someone may have been trying to do that. ZR: You’ve written some young adult novels. Do you approach writing YA differently from adult fiction? Does a story signify itself as skewing toward a younger audience from the outset, or is it something you discover once you’ve begun writing? FP: To put it simply, it’s more fun and less agony. I don’t imagine my disapproving peers saying, “Oh, look, she really is a terrible writer!” I think about kids, whom I like, and try to entertain them—just tell a story that will hold their interest. ZR: I found your book Anne Frank: The Book, The Life, The Afterlife truly fascinating. The lexicon of Holocaust literature is fraught with issues of morality, accuracy, and whether certain narratives stand as records of past atrocities or as attempts to commodify genocide. Do you see Frank’s diary as a catalyst for the Holocaust literature genre? If not, where do you feel it stands in relation to works like Weisel’s Night or Levi’s Survival in Auschwitz? FP: Unlike those universities in which Holocaust literature gets its own department, I don’t think of it as a genre, really. If we think of Anne Frank’s diary as a book about great intelligence of a certain sort, or a book about a brilliant adolescent girl of a certain sort, or a family of a certain sort, or incarceration, or war, or bigotry—well, that widens the scope of books we might want to (and should) compare it to. ZR: Once everyone has finished My New American Life, what are three recent books you’ve read that you’d recommend people pick-up? FP: Can I give you five? I can’t decide on three. In Zanesville, by Jo Ann Beard. Gryphon, by Charles Baxter. The Collected Stories of Deborah Eisenberg. A Visit from the Goon Squad by Jennifer Egan. Man in the Woods by Scott Spencer. ZR: In the long run, how would you like to be remembered as an author? What traits of your writing do you feel best define you? This interview appeared on the Book Passage blog on April 27, 2011.